-SG- Thanks again to Ian for the loan of this fold-out leaflet covering the introduction of the CS1 and ES2 models. 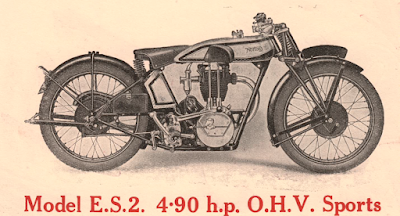 The illustration of the latter (above) shows it with the wrong Best and Lloyd oil pump fitted - obviously a matter of little concern to the publicity chaps at Norton's as they went on using the same retouched photo for quite a while! Worth noting too that the rear brake anchor set-up differs somewhat on production models to that is shown in this leaflet.